Dunnabeck Self-cateringDunnabeck is a charming detached Edwardian villa in a secluded position just outside Grasmere village with stunning views over Rydal Water and to Loughrigg and Wansfell beyond. The house was originally associated with the building of the Thirlmere pipeline and for many years belonged to Canon Rawnsley, co-founder of the National Trust. It was bought as a mountain retreat by the present owner's grandfather and retains its atmosphere as a family home with many personal touches and a comfortable relaxing feel. Guests are assured of a peaceful setting hard to come by in the heart of the National Park. 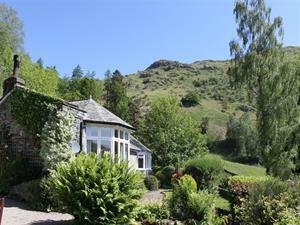 Dunnabeck is a charming detached Edwardian villa in a secluded position just outside Grasmere village with stunning views over Rydal Water and to Loughrigg and Wansfell beyond. Phone - charged at end of your stay. Children welcome from any age. Dunnabeck offers weekly bookings starting on Friday.